Here is the latest purse pattern that I made. I like the purse, but not the way it's put together. That is what I really like about sewing -- I can modify the pattern the second time around! The front pocket is not very useful, as it is too small, so I plan to expand it across the entire front of the purse the next time I make it. Also, the casings for the ties on the top don't go around the purse and I think the middle bulges out, so I will modify that part too. 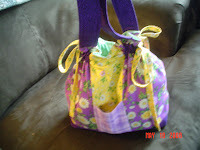 This purse can be made mostly with scraps, which will be fun to put different scraps together and see how it comes out.